What’s The Story With All Those Mobile Coverage Maps? An even more impressive visual than the last one for sure, due to its higher degree of color saturation and a 99% percent claim to boot (Verizon’s was 96% in case you’re keeping score). And that’s when it struck me…I was confused. Logic would suggest they can’t both be the owners of America’s largest cellular network, and yet that’s exactly what they appeared to be saying. Now, as the author of a commercial and technology law blog, and former denizen of Madison Avenue myself, I had to believe that if I was confused by these ads, the average wireless consumer probably was too. So I set out to get to the bottom of this little mystery. And to the bottom I got. 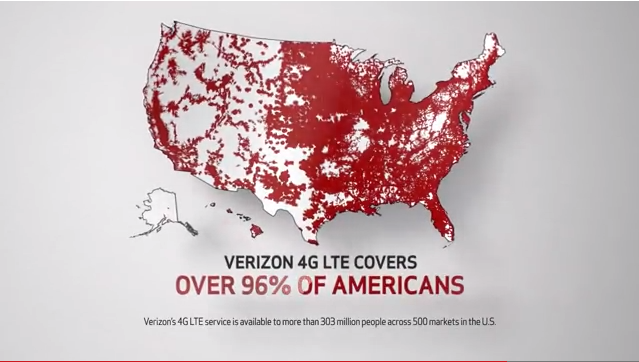 Verizon’s claim is that their 4G LTE network is in more places than any other 4G network—the key phrase here being 4G LTE. Verizon’s 4G LTE network is available in more places than AT&T’s, but LTE is a system for delivering mobile broadband Internet access only, and it’s one of several wireless broadband standards currently in use. So while Verizon can lay claim to having the largest data network featuring the latest generation technology, it doesn’t have the largest cellular network. If you define a mobile network as including both voice and data, and you include all systems that deliver what people commonly think of as data to their mobile devices—not just 4G LTE, but 3G technologies (the predecessor systems to 4G) and EDGE Mobil Internet technology—then AT&T has the largest nationwide network. And it’s something AT&T has gone to great lengths to set straight. 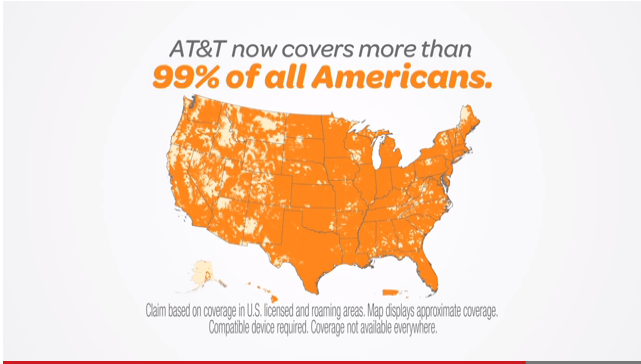 So the title of America’s largest mobile network goes to…AT&T…or Verizon if you’re talking about a 4G LTE network. It turns out these ads aren’t the first lap around the track for these two industry leaders, either. You have to go back to 2009, when both companies were promoting their previous generation 3G services, to get to the beginning of the story. Back then AT&T filed suit against Verizon in federal court to block its “There’s a map for that” ads, which contained 3G coverage maps which AT&T claimed misled consumers into believing that AT&T users could not use their cell phones (voice or data) anywhere outside the shaded 3G coverage areas. The ads never actually said that, but AT&T argued that was the implication. When a federal judge refused to enjoin Verizon from running the ads, AT&T dropped the lawsuit, landing it, in the eyes of many, in the role of sore loser. 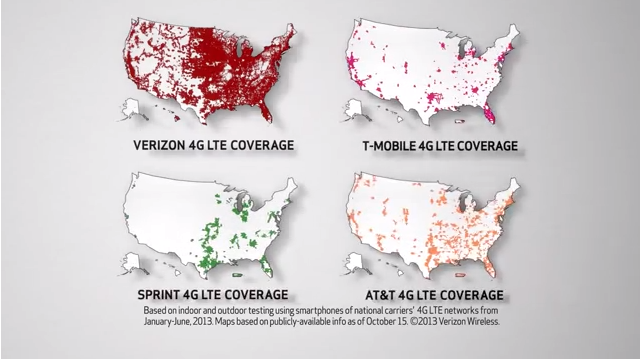 Verizon, having won the 3G coverage showdown, decided it was safe to continue the comparative coverage tactic to support the rollout of its 4G offering. But of course AT&T couldn’t stand idly by while Verizon besmirched the good reputation of its network, and so you have the state of affairs that exists today, with both companies lobbing colorful maps of the United States at us every opportunity they get. Are the “Reality Check” and “Bigger is Better” campaigns truthful? Technically, yes. But when making an unfair and deceptive advertising determination, literal truthfulness is not the standard. The real question is, does an ad contain a representation or omission that is likely to mislead a reasonable consumer? Even if an ad makes a claim that is true on its face, it can be found deceptive if it causes a false or mistaken belief among a significant minority of reasonable consumers, and that false belief is material to their purchase decision. The fact that I was confused makes me think that a significant minority of consumers might be as well. So will the mobile coverage game these two telcos are playing eventually lead to another legal standoff? It’s possible, but given the ineffectiveness of AT&T’s initial attempt to halt Verizon, and the negative fallout that came from it, you can be sure they will proceed carefully. If this competition does take another legal turn, in my opinion, it’s more likely that it will be because the FTC considers an enforcement action. But that’s far from a sure thing. What’s the bottom line? As I see it, there are three: First, the devil is alive and well in the details. Second, if you want to use your mobile device for texting, talking, surfing and using web applications, and you don’t live in the Mojave desert, either Verizon or AT&T will do just fine. And third, both companies have spent more than five years and a small country’s gross domestic product trying to convince you otherwise. The bigger is better could be deceptive a bit, but the other ads are not as verizon’s previous add spelt 3G in specific terms. Note of course how verizon uses 4g lte, not 4g which can include att’s and t-mobiles hsdpa networks, in which the latter can have speeds close to lte. In other countries using the term 3.9g has landed companies in legal hot water with regulators. I am not sure if the maps include roaming coverage or not. In the old analog days probably over 99% of the population was covered more like 99.5% or so as analog had long range.What’s next lte advanced coverage or internet coverage?